Obedience training doesn’t come naturally to everyone. And despite early efforts, training may slide a bit over time. One day you may suddenly realize that your little treasure pulls on the leash, jumps on strangers, and gets way too excited when he sees another dog or a squirrel. When you discover that your dog has become the leader of your pack—and every dog will fill that role if it sees a vacancy—the problem can seem overwhelming. You might be surprised at how some simple changes can turn things around and restore you to your rightful position. Whether your relationship with your dog needs minor tinkering, or a major overhaul, we can help. Our goal is to ensure that dogs are never surrendered by owners because of behavioral issues. We see many dogs that other trainers have already given up on; no problem is too big to handle. Our standard programs and described below. Contact us to discuss your particular training needs. Training sessions and phone consults can be scheduled at your convenience. Send us your dog and let Lucas transform it! Our most popular program is the four-week inboard training program, in which dogs learn all basic obedience commands (sit, down, stay, heel and come). During this program, we can set aside time to focus on specific problems such as leash aggression. Every dog learns at a different pace; the longer you leave the dog, the more it will learn. This package is for dogs 16 weeks or older. 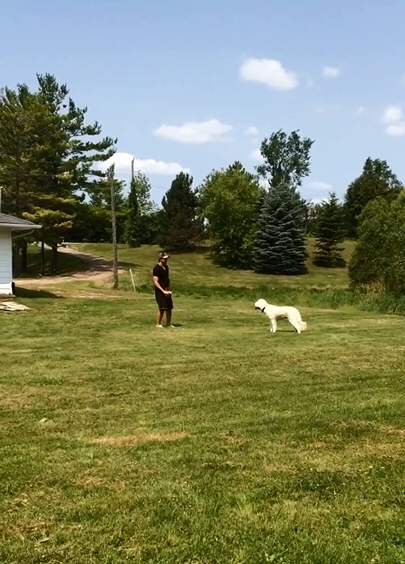 While in training, owners are not permitted to visit as it will upset and distract the dog. However, we provide regular updates on your dog’s progress. At the conclusion of the program, you receive training on how to handle your dog. If you want a perfect dog, this is the package for you! Note: your dog must be fully vaccinated for Kennel Cough at least 14 days prior to visiting us, and no more than 3 months. Your dog must also be on a flea and worm prevention program. All documents must be faxed to us before your dog visits. We have held off giving feedback, because I wanted to make sure I wasn’t still in a dream! Our pup, Roscoe, has now been home with us for 6 weeks. And from the day he returned right up to today, he retains the training and behavior he demonstrated at the conclusion of the training with Lucas. We tried local evening group classes, but made limited progress. Each dog had different challenges that needed to be addressed in too short a timeframe. We approached Lucas and Sherry explaining where we were and where we wanted, needed to be. We are an active family on the move a lot and wanted a pup to be a part of that unit to participate with us on our activities. They accepted the challenge without hesitation and confident we could be there in a short amount of time. We made our notes, summarizing our current situation and challenges in detail and submitted them to Lucas. We met with Lucas: At the drop off date, we reviewed these items and he observed how Roscoe interacted within our family unit. We said our goodbyes and entrusted our pup into Lucas’ care. The drop off was difficult, but we knew it was needed. Progress updates: Lucas kept in touch with us, giving us updates and enquiring if he saw odd behavior to understand where it may have arisen. Seeing the ‘Results of Lucas’: It was a Sunday morning when we got the news that we could plan to pick up our pup at the end of the following week. We were ecstatic, but nervous. We were worried that Roscoe might only listen to Lucas, and not to us. We were worried that Roscoe would revert to the behavior he had before he left home. And we were worried about whether we were skilled enough to uphold this training. We arrived to be re-united with our pup. It’s like getting your puppy all over again. It was awesome. Lucas controlled the situation and advised us what to do and what to expect. He then explained some of the tools, methods and commands he used. Then he started training us. One by one, mom had a turn, dad had a turn, our 8 year old son had a turn then the test, our 6 year old daughter had her turn to learn how to work with Roscoe. Lucas worked with our family until we were all confident in our abilities, and Roscoe’s abilities. His instructions were simple enough for all ages to follow. Then we headed home. All by ourselves. Without Lucas. Still a little nervous about what we’d wake up to the next day. We woke up to—and continue to wake up to—a well-behaved and obedient dog, who loves to play but understands his limits and role within our family unit. Last weekend we put him to the test, having over 80 people plus 5 visiting dogs to our home for a family reunion. I would summarize this as distraction, territorial and excitement levels at their max! We gave him commands, and near or far he nailed them! Our visitors could not believe how calm and well-behaved a dog he was. This transformation has been a journey, learning about not only our dog but also ourselves—a journey that Lucas guided us through and continues to support. Lucas and Sherry, thank you for loving our pup as much as we do and spending time to develop him into the awesome family member that we knew he could be! We sent Cash to Lucas for the 4 week inboard training when he was 6 months old. The timing was perfect for us, as we were heading on a 2 week vacation, and the combination of boarding & training was very appealing, since young dogs of any sort can be quite challenging, especially for those of us with absolutely no experience owning a dog. Cash was a great puppy. He always wanted to please us, and is still this way, but he didn’t always do as asked. He jumped up on neighborhood kids & visitors, pulled on the leash, and leapt at other dogs as we walked. We live on a quiet court and also wanted to be able to have Cash off leash out front while we worked or talked with neighbours. Lucas asked what our expectations were from the training and we told him we wanted Cash to walk nicely on leash, curb his jumping, plus be able to be outside off leash. I was skeptical, since we hadn’t had much luck with these things (in spite of all my Cesar Milan watching and book reading!). The transformation in 4 weeks was amazing. He was a changed dog. Not only had Cash mastered all the things we had asked…. and many things we had not asked, including down, stay, leave it, and looked to us for direction under every circumstance. Lucas really is a dog whisperer. I started taking private lessons with him after getting my second dog, and I’m so pleased with what I have taken away from our lessons. Lucas has taught me how important it is to be a gentle yet firm, consistent leader. He has provided advice on so many topics, from introducing a second dog to the pack, to counter surfing, hand shyness, fears of certain things, to proper collar fittings. I really like his positive reinforcement approach to training. My two dogs are now walking beautifully on leash, side by side, without pulling. He worked with my standard Bernedoodle to discourage jumping on people, and I’ve never seen him do it again. I can now confidently take control of my two dogs (in one hand!) in large crowds of people and dogs—something I was very wary of doing before. WHY TRAIN WITH A PROFESSIONAL??? We adopted Luke when he was 8 weeks old, and brought our little bundle of joy home with great expectations of instant obedience and fun. Sound familiar? Despite working with him over the months, we still found ourselves in situations where we couldn’t trust him to not run away or pull on the leash or jump up on people, etc. When Jean Luc (a.k.a.Luke), a male Australian Bernedoodle, was 10 months old we decided to “fast track” his training and send him to Lucas. The weeks without him in the house were difficult ones, because as much as we wanted certain traits to disappear, we loved the heck out of the little guy. He had changed our household and our lifestyle while with us, and he left a hole when he went off to spend time with “The Sheriff”. As time seems to have a habit of doing these days, it passed quickly enough, and the day finally came when Lucas told us that Luke was ready to be re-introduced to us. To everybody’s relief, he hadn’t forgotten us, and the re-introduction was complete following some very thorough instruction on the proper way to re-enforce the training that had been done (which was subsequently followed up with a flurry of phone calls and emails to make sure that anything we were encountering was being handled correctly by us). What do we like most about Luke now? Today, Luke walks peacefully at our side – no pulling, no sudden stops. He heels and follows along beside us when we ask him to. No matter where he is, when we tell him to come, he drops what he is doing and runs to us, coming to a sit beside us and waiting for his next direction. He sits patiently waiting for a door to open until we tell him he can go. He walks off leash, when safe, on trails and parks, and comes back to us as soon as we call him. At our cottage, he has learned not to jump up on people, to stay on our property and not to wander. Today, Luke is a much happier dog than he was just a short time ago. He enjoys his freedom, and we enjoy the knowledge that he understands his boundaries, which gives us freedom as well. What do we like most about Luke now? Everything. He came back to us with the same vibrant and fun personality that he had when he left us – with a load of self-discipline added in for good measure. We have become better parents, and he has become a happier member of our family.